In case you have forgotten already, it was a tad cold. Minus three at start of play. Nevertheless, we had 2807 hauled outside. 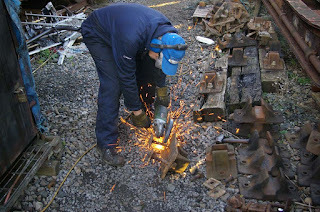 First of all, it was necessary to squeeze up the loco and tender in order to connect the main drag link. P&O came in handy as a buffer stop! 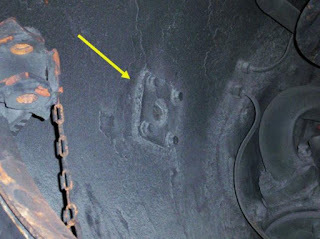 Then we rolled over a pit so that we could connect the hoses between loco and tender. 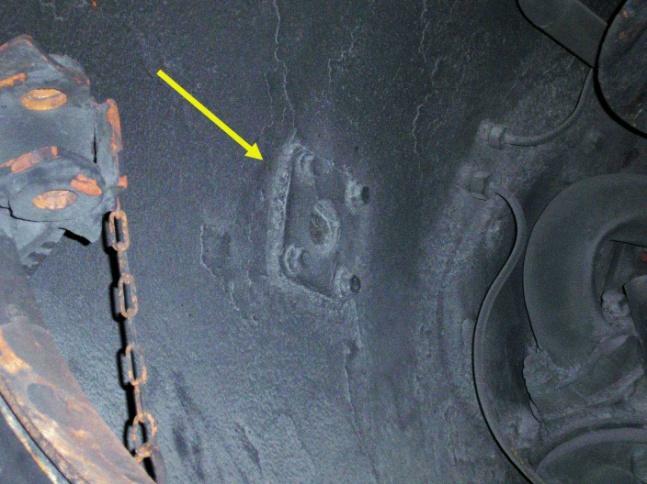 While that was going on, Clive was filling the boiler, initially via the blow-down valve (which is a large orifice), but at times via the injectors (which only have a 10 mm hole). Mostly, there was Bruce and myself underneath pushing on hoses and doing up nuts, with John T acting as gopher and Gil chipping in. All of this took until lunchtime - partly because of the cold, and partly because the clamps and the nuts didn’t always want to play ball! 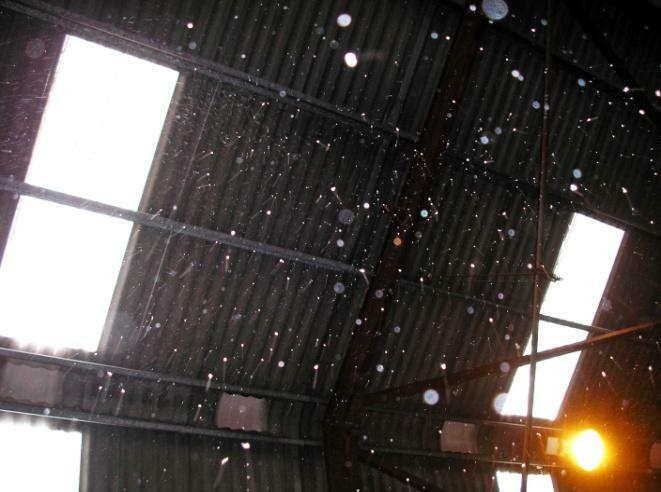 … and the view inside the shed looked like this! Yes, not only was it snowing outside, but it was also snowing inside. So the consensus was to call it a day. There was no enthusiasm to light a warming fire for a steam test on Thursday, as the forecast for Thursday was worse than for today. 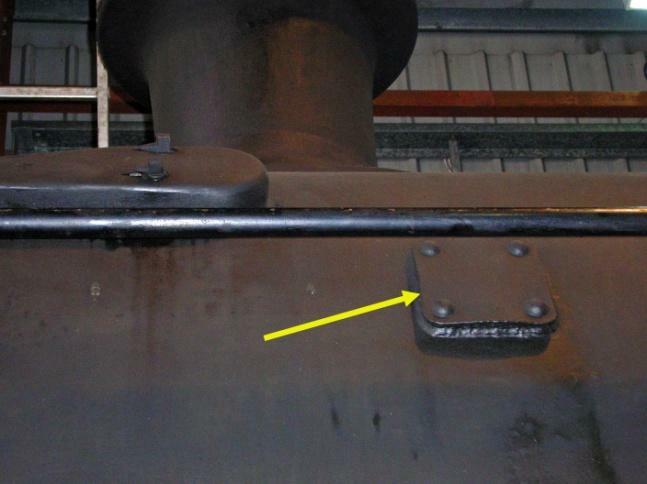 By the way, I was wondering why there’s a patched-up hole in 2807’s smokebox. It is as if something either was there, or might have been there in another life. Anyone know what it was intended for? Outside, on RHS of smokebox. After a Herculean effort by Mark Young, Mike Solloway, Clive Norton, Chris Smith and Dan Wigg and the BES insurance inspector they managed to get 7820, 7903, and 35006 through their annual steam exams today. 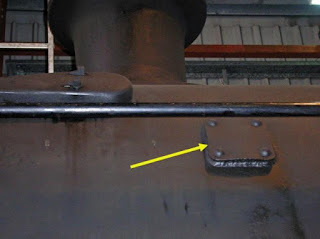 (5) Weld broken on smokebox door handle (inner handle for dart). Bearing in mind the appalling conditions (Winchcombe was cut off for most of the day) this was well above and beyond the call of duty. Only three people arrived at the railway today, and we all left at 11.30. Apart from rabbit tracks, mine were the only footprints leading round to our van! I applied an enamel top coat to six rail chairs and then decided enough was enough! 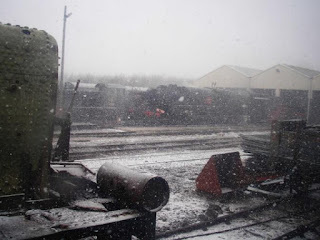 The side door to the loco shed had not been closed (due to a build up of snow), so I freed that and closed it. Thank goodness for traction control! It was a struggle getting out of the car park. Stanway Hill was closed. There were large drifts on the road between Winchcombe and Toddington, though passable as one lane at the worst point. The road from Toddington towards Tewkesbury was closed due to a fallen tree. March 30 & 31; April 1, 2, 17 to 26 inclusive, 28, 29.